Wrapped in gold paper this sweet is a fruit boiling with a chewy centre. Its a traditional sweet. I like the orange ones. This black and white rectangular sweetie has a chewy bit in the middle. A minty wee number. Been around for ages. Sometimes we sell a different make which is brown in colour but just as tasty. A very old fashioned sweet. A hard boiling with a sherbet filling. We package our boilings in bags which the sweets do not stick to the paper. This is important when dealing with boilings. A true old one from the past. A hard strawberry boiling with a sherbet filling. Sweets are in special bags so they last longer and dont stick as fast to the bag.Depends how long you can keep them in the bag too! 2Just tastes like the real thing! 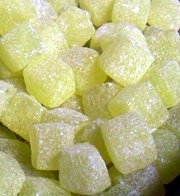 However it does not have a chewy centre....thats Kola Kubes that you are thinking about. A blackcurrant boiling with a liquorice chewy centre.